Wrightsville Beach, NC plays host to the third annual PPD Beach 2 Battleship Triathlon on Saturday, November 13, 2010. 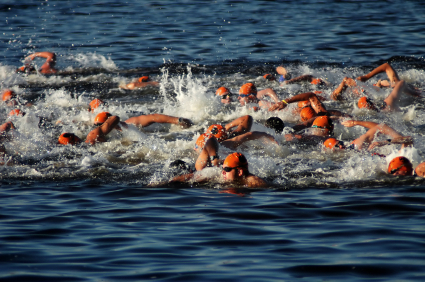 Residents and visitors to Wilmington and Wrightsville Beach are invited to cheer on the athletes as they make their way from the Intracoastal Waterway in Wrightsville Beach to Battleship Park along the Cape Fear River - swimming, biking, and running to get there. If you're not a part of this race as participant or cheerleader, then please be advised that traffic throughout the area will be affected during the race time. The PPD Beach 2 Battleship is a full Iron distance and half Iron distance triathlon. The race starts with a 2.4 (full) or 1.2 (half) mile swim - with the current - point to point in the Banks Channel of Wrightsville Beach. The 112 (full) or 56 (half) mile bike takes competitors from Wrightsville Beach through northern Wilmington, up towards White Lake, and back to the transition area at the Battleship North Carolina. The 26.2 (full) or 13.1 (half) run covers two bridges, starting and ending at Battleship Park. The PPD Beach 2 Battleship Triathlon was an Editor's Choice from Triathlete Magazine as one of the 100 best races. You can find full information at their website: www.Beach2Battleship.com. We hope that visiting competitors can recover enough to take in the town, enjoy the area, and plan on coming back next year. For information on other area races, please see an earlier post on Wilmington YMCA Triathlon 2010 at Wrightsville Beach NC.